Epona: Celtic goddess of fertility and protector of horses, donkeys and mules, held in high regard by both Gaelic and Roman cultures. It is thought that Epona and her horses led the human soul into the afterlife. 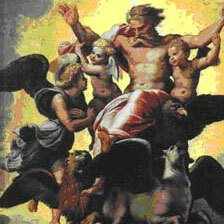 Ezekiel: Israelite exile chosen by God to deliver his prophecies during the 6th century BC. Regarded as a saint in Christianity and third of the major prophets in Judaism, he foretold the destruction of the city of Juda. 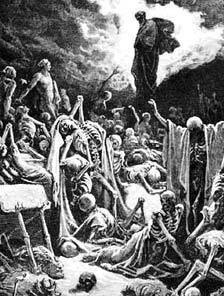 His greatest miracle was bringing the dead back to life, told in The Bible, chapter 37 of the Book of Ezekiel. 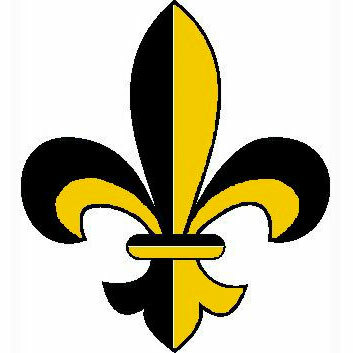 Fleur-de-Lis: also known as the Merovingian Lily, the three-pronged flower-head was as very sacred symbol, (of the goddess Juno - the Lilly Maid, mother of war god, Mars), used by the early Gauls and the powerful Salian Frankish dynasty that reigned across France from circa 481 to 751, and continued as the representation of France by the Normans. Used in many other European coats of arms during the Middle Ages, the Fleur-de-Lis also had martial as well as religious connotations. The Roman Catholic Church decreed that it should be the emblem of the Virgin Mary and therefore symbolic of the holy bloodline, or Sangraal, while the three petals of its flower are thought to represent not only the Holy Trinity, but also the Christian values of faith, wisdom and chastity. However, the Lilly’s meaning holds striking duality and affinity to Mars, as well as the values of war; Joan of Arc carried the Fleur-de-Lis on her flag as she rode with her French troops to victory in battle, while the military often interpret its shape into that of an ornate, upright spearhead – indicating power, fearsome force and brute strength. Freya: Norse Pagan goddess of love, beauty and fertility. Called upon to assist with childbirth and success in romantic ventures, she also ruled over war and death – legends state that she brought half of all dead souls into her hall of Fólkvangr, while Odin took the remainder to Valhalla. 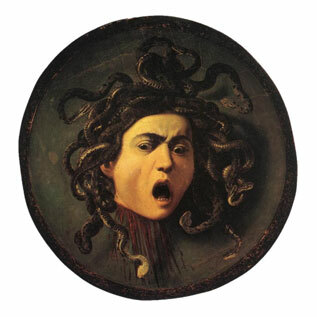 Gorgon: Hideous female creatures from Greek mythology. Derived from the Greek gorgós, or ‘terrible’, these vile women possessed claws, fangs and scaled skin, while their hair was made of living, writhing serpents. First appearing in the very earliest written records, including the writings of Homer, their likenesses were often placed upon objects or even houses, the better to provide protection with their deadly gazes that could turn a man into stone. Within mythology and legend, three Gorgon sisters existed as the daughters of the sea god Phorcys and Ceto the sea monster; Stheno and Euryale who were immortal, and Medusa who was not. The hero Perseus was able to sever her head while looking at her reflection in Athena’s mirrored shield, but upon returning to court and holding up Medusa’s head, everyone present turned to stone. 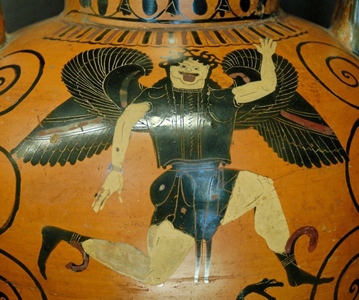 The superstitious also believed that drawing blood from the right side of a Gorgon granted the power of resurrection, while the left side was a fatal poison. 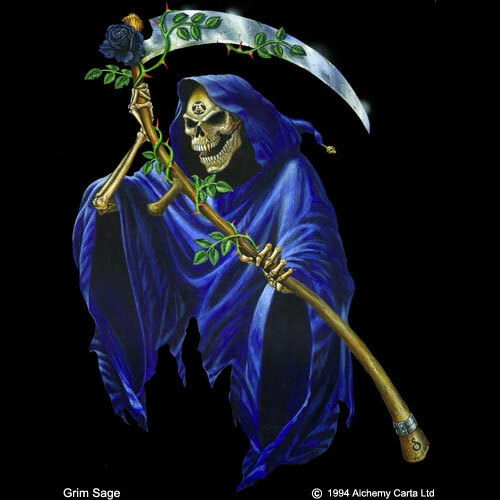 Grim Reaper: from medieval European folklore, the generic name given to the personification of death, the arbitrary collector of mortal lives. Also known as 'Death' and the 'Grim Sage', and often confused with 'Old Father Time'. The 'Reaper' is generally depicted as a priest-robed skeletal being, carrying a scythe, needed for his eternal work of the harvesting of souls. The word grim, meaning severe, cruel, harsh is Old English, derived from ancient Germanic. The most ancient and efficacious remedy for any ailment. 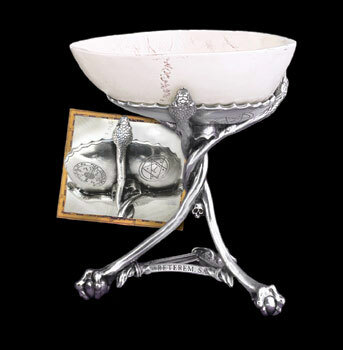 Alchemy's Hanged Man's Skull Cup is made of bone china out of a mould taken from a male, human skull. The stem is typical in style of an English vernacular, 18th century, craftsman made artefact, and hand made here of fine English pewter. 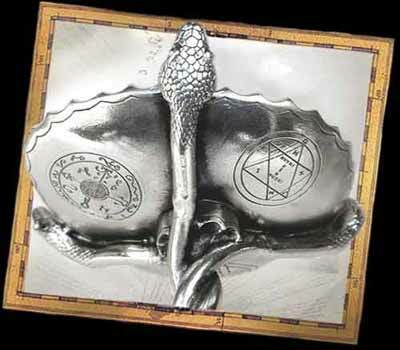 It is formed of three entwined, 'healing' snakes which terminate in typical claw feet, and is engraved with a potent variety of spells and seals. Guards against disease and has curative powers. Look at this seal every day and it will keep one healthy and long living. The cup should be left overnight where the stars can shine on the engraved charm. On the following morning the cup should be charged with the water or wine and drunk to cure any illness and misfortune caused by evil spirits. An old British superstition dating from mediaeval times, claimed that anybody drinking water or wine from the skull of a hanged man would be cured of all their ills. Other related beliefs include the scraping of 'white moss' from the skull of a murdered man, which has similar magical and medical properties. 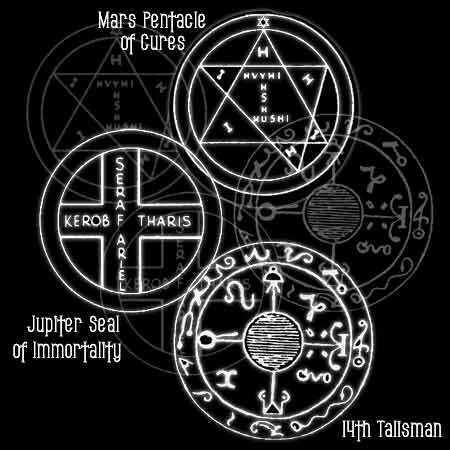 It seems that such beliefs originate from the idea that the skull of a man who's life has been suddenly and violently ended, will still retain much of his life force within its walls and can be extracted and consumed by the lucky benefactor. Skull cup related stories describe one of the secret rituals of the Templars, having possession of the skull and thighbones of John the Baptist they would fill the skull with a peyote based hallucinogenic, and sacramentally drink from it in a sacred ritual that was said to induce prophetic visions. Centuries later, on Christmas in 1811, Lord Byron, the celebrated gothic poet invited his friends to the ruins of Newstead Abbey, where, in mock ritual, they were to dress in monks robes and drink from a silver cup made from a human skull.